Where I come from, the relationship to precipitation is entirely different. There, back east, people tend to take it for granted: the humidity in the summer, the snow in the winter, the rain year-round, the occasional hurricane. Shoot, even the lakes, ponds, and rivers. They’re everywhere, and pretty dependable. We have monsoon season, and it’s a big deal. Different people have different definitions for our monsoon season in New Mexico. Some go by calendar dates; others by less numerical methods. Personally, I don’t call it monsoon season until the temperatures get noticeably cooler and we have regular (as in, more than one) respectable afternoon thunderstorms. At the beginning of Monday’s afternoon walk with Ann, I noticed clouds building up, but didn’t think too much of it. Those clouds prove deceptive all too often. I continued not thinking too much of it until around the middle of our walk when suddenly…. Drip. Drip. Drip. Drip. Dripdripdripdripdripdripdripppppppppp it was raining!! We finished the whole walk, both of us getting good and wet. My four-legged companion wasn’t nearly as delighted as I was, but hey, I like to think she had a valuable character-building experience. The next question was: Would I go for a run? I admit that I wavered for a moment. After shaking that ridiculous hesitation from my head, though, I flew into my running clothes faster than I have in weeks. No need to carry a water bottle or strategically aim for the shadiest side of the street on this run! I left Ann to roll her towel-dried-but-still-damp self around on the carpet at home, and trotted out into the rain. 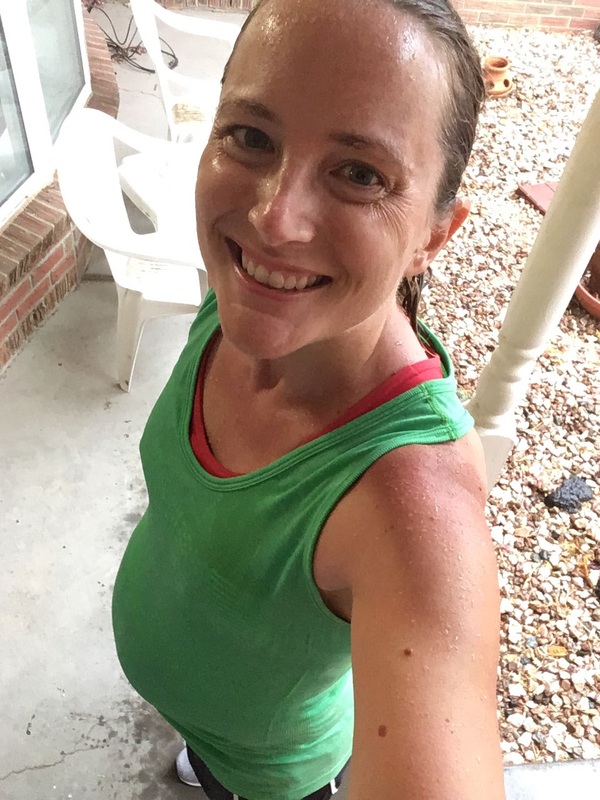 I don’t think it’s going too far to say that running in the rain – not a spitting drizzle, not a 5-minutes-and-done deal, but RAIN – after enduring an extended heat wave is something akin to a religious experience. I didn’t give a thought to my pace, or how tangled my ponytail was getting, or how waterlogged my shoes were. I just let the rain wash over me. I felt cleansed; I felt like my faith was being restored. I finished the run soggy and squishy and completely rejuvenated. Is this what baptismal water feel like? If you’re enduring a heat wave of any kind in your life right now, I hope that your rain comes soon. And when it does, I hope you go for a run in it. I used to live in Tucson and miss the monsoon season! Such a lovely time, and such a relief from the constant heat. P.S. When it rains here in Alaska in the summer, it’s usually around 58 and not as nice to run through. P.S.S. Big, big congrats on the girl. Pregnancy is the best of times. So many people have been writing about liking running in the rain lately–I avoid it, I’m always afraid I’m going to slip! Maybe I need to get a little braver. Also, CONGRATS!! Absolutely, running in a warm rain is invigorating! As long as the blisters and chafing stay away, it can be incredibly enjoyable. (I’m in the upstate New York town that usually is among the leaders the nation in rain and snowfall). And yes, congratulations on the future running partner! I like running in the rain! With almost no one else outside that feeling sets in of being all alone out in the world, both unsettling and exhilarating all at once!